One of the most popular neighborhoods in Tokyo is Kichijoji. I’d only passed by the station on my way to teach at Asia University once a week, but never had the time to stop off. 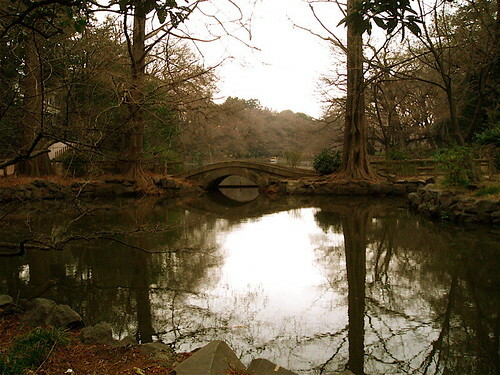 Much of the area is like any other Tokyo neighborhood with the usual shops and restaurants, but there is one particularly charming street that leads to Inokashira Park. This street has a village feel with a mix of cozy cafes and import stores crammed with folk crafts from around the world. It’s a short street but I loved walking around there. The park is one of the better parks of Tokyo. It encompasses a zoo, the Ghibli Museum, a shrine, a casual pan-Asian restaurant, and a river with giant swan-shaped pedal boats for rent, reputed to be bad luck for couples who ride them together. The park has a local feel, with paths leading out of the park and ambling into quiet streets. It reminded me of Lithia Park in Ashland, Oregon, with its long creek, and its vitality. 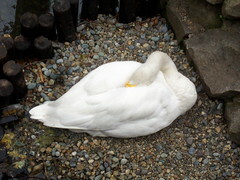 I visited the Inokashira Park Zoo, which was free with the Grutt Pass. I liked that the zoo focused on native Japanese species instead of stocking itself with exotic species from further afield. On the other hand, I found it comical that many species were tagged with “Japanese”. 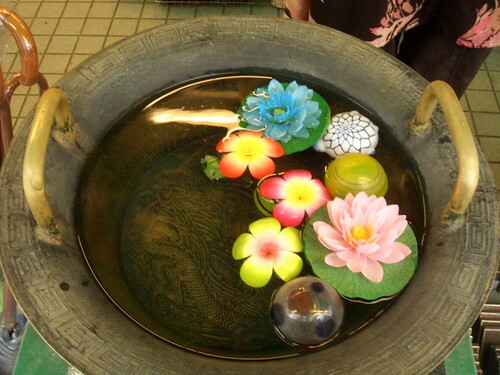 Like the common squirrel was tagged as the “Japanese squirrel”, or the common raccoon as the “Japanese raccoon”. They were presented as subspecies, but probably should have been labeled as breeds. I was really excited to see the Amur leopard cat. The wild cat ranges throughout East Siberia and Korea but was tagged in some places as the “Tsushima leopard cat”. Tsushima is a small Japanese island lying between Korea and Japan. I guess it could be a subspecies, except that they both share the same scientific name, Felis bengalenses euptilura. There were so many similar instances of species revisionism that I imagined some drunk nationalistic biologist giggling all night as he “discovered” new subspecies for the glory of the emperor. The most interesting part of the zoo is the aquarium which featured waterfowl as well as insects and reptiles, including one really big cane toad from the Americas. It was the size of one of the Amur cats, but thankfully wasn’t labeled as the “Japanese giant toad”. Creative taxonomy aside, I actually enjoyed the casual atmosphere of the zoo. It was more of a park for kids that happened to have animals. Still, like all zoos, it was depressing at times to see the animals pacing nervously in their cages. Watching the 50 year old Asian elephant, Hanako, was especially sad, as she rocked back and forth, gazing off into the distance, dreaming of a faint childhood in Thai forests.